The amount of future climate change will largely be determined by choices society makes about emissions. Lower emissions of heat trapping gases mean less future warming and less severe impacts. Emissions can be reduced through improved energy efficiency and switching to low-carbon or non-carbon energy sources. Explore mitigation – ways of reducing future climate change. Mitigation refers to actions that reduce the human contribution to the planetary greenhouse effect. Mitigation actions include lowering emissions of greenhouse gases like carbon dioxide and methane, and particles like black carbon (soot) that have a warming effect. Increasing the net uptake of carbon dioxide through land-use change and forestry can make a contribution as well. As a whole, human activities result in higher global concentrations of greenhouse gases and to a warming of the planet – and the effect is increased by various self-reinforcing cycles in the Earth system (such as the way melting sea ice results in more dark ocean water, which absorbs more heat, and leads to more sea ice loss). Also, the absorption of increased carbon dioxide by the oceans is leading to increased ocean acidity with adverse effects on marine ecosystems. Four mitigation-related topics are assessed in this chapter. First, it presents an overview of greenhouse gas emissions and their climate influence to provide a context for discussion of mitigation efforts. Second, the chapter provides a survey of activities contributing to U.S. emissions of carbon dioxide and other greenhouse gases. Third, it provides a summary of current government and voluntary efforts to manage these emissions. Finally, there is an assessment of the adequacy of these efforts relative to the magnitude of the climate change threat and a discussion of preparation for potential future action. While the chapter presents a brief overview of mitigation issues, it does not provide a comprehensive discussion of policy options, nor does it attempt to review or analyze the range of technologies available to reduce emissions. These topics have also been the subject of other assessments, including those by the National Academy of Sciences53 and the U.S. Department of Energy.76 Mitigation topics are addressed throughout this report (see Ch. 4: Energy, Key Message 5; Ch. 5: Transportation, Key Message 4; Ch. 7: Forests, Key Message 4; Ch. 9: Human Health, Key Message 4; Ch. 10: Energy, Water, and Land, Key Messages 1, 2, 3; Ch. 13: Land Use & Land Cover Change, Key Messages 2, 4; Ch. 15: Biogeochemical Cycles, Key Message 3; Ch. 26: Decision Support, Key Messages 1, 2, 3; Appendix 3: Climate Science Supplemental Message 5; Appendix 4: FAQs N, S, X, Y, Z). Setting mitigation objectives requires knowledge of the Earth system processes that determine the relationship among emissions, atmospheric concentrations and, ultimately, climate. Human-caused climate change results mainly from the increasing atmospheric concentrations of greenhouse gases.3 These gases cause radiative “forcing” – an imbalance of heat trapped by the atmosphere compared to an equilibrium state. Atmospheric concentrations of greenhouse gases are the result of the history of emissions and of processes that remove them from the atmosphere; for example, by “sinks” like growing forests.4 The fraction of emissions that remains in the atmosphere, which is different for each greenhouse gas, also varies over time as a result of Earth system processes. The impact of greenhouse gases depends partly on how long each one persists in the atmosphere.5 Reactive gases like methane and nitrous oxide are destroyed chemically in the atmosphere, so the relationships between emissions and atmospheric concentrations are determined by the rate of those reactions. The term “lifetime” is often used to describe the speed with which a given gas is removed from the atmosphere. Methane has a relatively short lifetime (largely removed within a decade or so, depending on conditions), so reductions in emissions can lead to a fairly rapid decrease in concentrations as the gas is oxidized in the atmosphere.6 Nitrous oxide has a much longer lifetime, taking more than 100 years to be substantially removed.7 Other gases in this category include industrial gases, like those used as solvents and in air conditioning, some of which persist in the atmosphere for hundreds or thousands of years. Carbon dioxide (CO2) does not react chemically with other gases in the atmosphere, so it does not, strictly speaking, have a “lifetime.”8 Instead, the relationship between emissions and concentrations from year to year is determined by patterns of release (for example, through burning of fossil fuels) and uptake (for example, by vegetation and by the ocean).9 Once CO2 is emitted from any source, a portion of it is removed from the atmosphere over time by plant growth and absorption by the oceans, after which it continues to circulate in the land-atmosphere-ocean system until it is finally converted into stable forms in soils, deep ocean sediments, or other geological repositories (Figure 27.1). 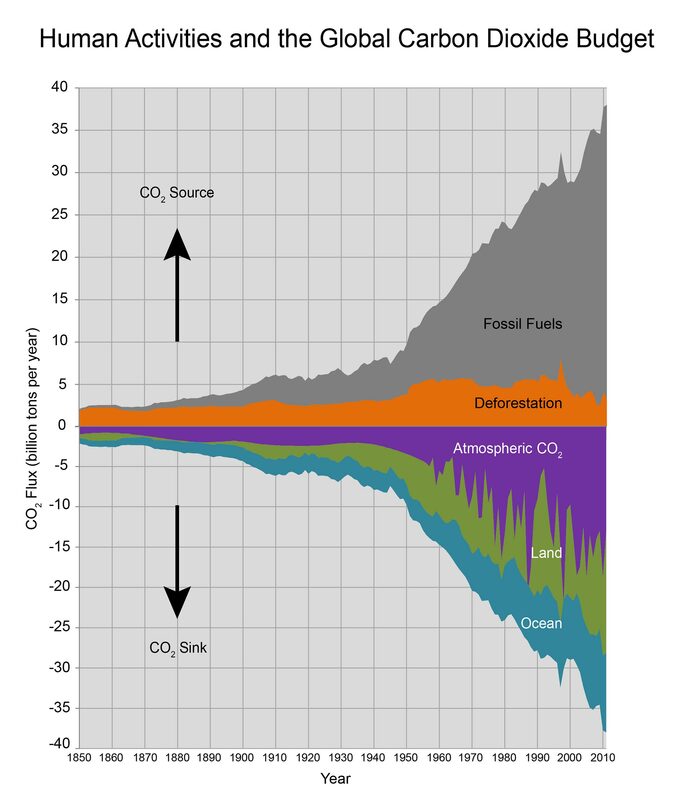 Of the carbon dioxide emitted from human activities in a year, about half is removed from the atmosphere by natural processes within a century, but around 20% continues to circulate and to affect atmospheric concentrations for thousands of years.10 Stabilizing or reducing atmospheric carbon dioxide concentrations, therefore, requires very deep reductions in future emissions – ultimately approaching zero – to compensate for past emissions that are still circulating in the Earth system. Avoiding future emissions, or capturing and storing them in stable geological storage, would prevent carbon dioxide from entering the atmosphere, and would have very long-lasting effects on atmospheric concentrations. In addition to greenhouse gases, there can be climate effects from fine particles in the atmosphere. An example is black carbon (soot), which is released from coal burning, diesel engines, cooking fires, wood stoves, wildfires, and other combustion sources. These particles have a warming influence, especially when they absorb solar energy low in the atmosphere.11 Other particles, such as those formed from sulfur dioxide released during coal burning, have a cooling effect by reflecting some of the sun’s energy back to space or by increasing the brightness of clouds (see: Ch. 2: Our Changing Climate; Appendix 3: Climate Science Supplement; and Appendix 4: FAQs). The effect of each gas is related to both how long it lasts in the atmosphere (the longer it lasts, the greater its influence) and its potency in trapping heat. The warming influence of different gases can be compared using “global warming potentials” (GWP), which combine these two effects, usually added up over a 100-year time period. Global warming potentials are referenced to carbon dioxide – which is defined as having a GWP of 1.0 – and the combined effect of multiple gases is denoted in carbon dioxide equivalents, or CO2-e. The relationship between emissions and concentrations of gases can be modeled using Earth System Models.4 Such models apply our understanding of biogeochemical processes that remove greenhouse gas from the atmosphere to predict their future concentrations. These models show that stabilizing CO2 emissions would not stabilize its atmospheric concentrations but instead result in a concentration that would increase at a relatively steady rate. Stabilizing atmospheric concentrations of CO2 would require reducing emissions far below present-day levels. Concentration and emissions scenarios, such as the recently developed Representative Concentration Pathways (RCPs) and scenarios developed earlier by the Intergovernmental Panel on Climate Change’s (IPCC) Special Report on Emissions Scenarios (SRES), are used in Earth System Models to study potential future climates. The RCPs span a range of atmospheric targets for use by climate modelers,12,13 as do the SRES cases. These global analyses form a framework within which the climate contribution of U.S. mitigation efforts can be assessed. In this report, special attention is given to the SRES A2 scenario (similar to RCP 8.5), which assumes continued increases in emissions, and the SRES B1 scenario (close to RCP 4.5), which assumes a substantial reduction of emissions (Ch. 2: Our Changing Climate; Appendix 5: Scenarios and Models). There are several important uncertainties in the current carbon cycle, especially the overall size, location, and dynamics of the land-use sink9,10 and technological development and performance. Simulating future atmospheric concentrations of greenhouse gases requires both assumptions about economic activity, stringency of any greenhouse gas emissions control, and availability of technologies, as well as a number of assumptions about how the changing climate system affects both natural and anthropogenic sources. Very High. Observations of changes in the concentrations of greenhouse gases are consistent with our understanding of the broad relationships between emissions and concentrations. Uncertainties about the carbon cycle could affect these calculations, but the largest uncertainties are the assumptions made about the strength and cost of greenhouse gas emissions policies. The confidence in the conclusion is high. This is a contingent conclusion, though – we do not have high confidence that the current emission rate will be sustained. However, we do have high confidence that if we do choose to limit concentrations as in the B1 scenario, emissions will need to peak soon and then decline. Economic and technological forecasts are highly uncertain. High. The statement is a summary restatement of published analyses by government agencies and interpretation from the reviewed literature. Underlying data come primarily from U.S. Forest Service Forest Inventory and Analysis (FIA) plots, supplemented by additional ecological data collection efforts. Modeling conclusions come from peer-reviewed literature. All references are in Section 2 of the Mitigation Chapter. 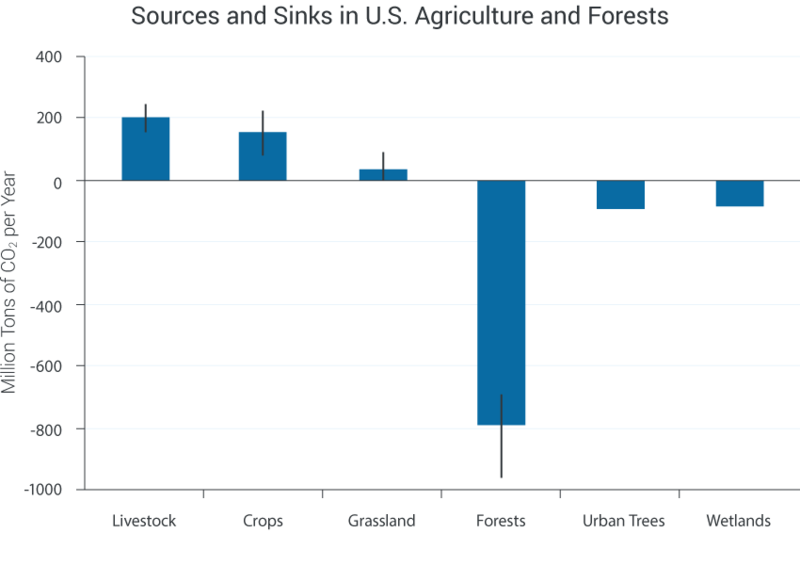 Studies have shown that there is a large land-use carbon sink in the United States.25,28,29 Many publications attribute this sink to forest re-growth, and the sink is projected to decline as a result of forest aging30,31,32,33 and factors like drought, fire, and insect infestations31 reducing the carbon sink of these regions. FIA plots are measured extremely carefully over long time periods, but do not cover all U.S. forested land. Other U.S. land types must have carbon content estimated from other sources. Modeling relationships between growth and carbon content, and taking CO2 and climate change into account have large scientific uncertainties associated with them. High. Evidence of past trends is based primarily on government data sources, but these also have to be augmented by other data and models in order to incorporate additional land-use types. Projecting future carbon content is consistent with published models, but these have intrinsic uncertainties associated with them. The identification of state, local, regional, federal, and voluntary programs that will have an effect of reducing greenhouse gas emissions is a straightforward accounting of both legislative action and announcements of the implementation of such programs. Some of the programs include the Carbon Disclosure Project (CDP), the American College and University Presidents' Climate Commitment (ACUPCC), U.S. Mayors Climate Protection Agreement,34 and many other local government initiatives.35,36 Several states have also adapted climate policies including California's Global Warming Solutions Act (AB 32) and the Regional Greenhouse Gas Initiative (RGGI). The assertion that they will not lead to a reduction of US CO2 emissions is supported by calculations from the U.S. Energy Information Administration. The major uncertainty in the calculation about future emissions levels is whether a comprehensive national policy will be implemented. Very High. There is recognition that the implementation of voluntary programs may differ from how they are originally planned, and that institutions can always choose to leave voluntary programs (as is happening with RGGI, noted in the chapter). The statement about the future of U.S. CO2 emissions cannot be taken as a prediction of what will happen – it is a conditional statement based on an assumption of no comprehensive national legislation or regulation. Carbon dioxide made up 84% of U.S. greenhouse gas emissions in 2011. Forty-one percent of these emissions were attributable to liquid fuels (petroleum), followed closely by solid fuels (principally coal in electric generation), and to a lesser extent by natural gas.23 The two dominant production sectors responsible for these emissions are electric power generation (coal and gas) and transportation (petroleum). Flaring and cement manufacture together account for less than 1% of the total. If emissions from electric generation are allocated to their various end-uses, transportation is the largest CO2 source, contributing a bit over one-third of the total, followed by industry at slightly over a quarter, and residential use and the commercial sector at around one-fifth each. A useful picture of historical patterns of carbon dioxide emissions can be constructed by decomposing the cumulative change in emissions from a base year into the contributions of five driving forces: 1) decline in the CO2 content of energy use, as with a shift from coal to natural gas in electric generation, 2) reduction in energy intensity – the energy needed to produce each unit of gross domestic product (GDP) – which results from substitution responses to energy prices, changes in the composition of the capital stock, and both autonomous and price-induced technological change, 3) changes in the structure of the economy, such as a decline in energy-intensive industries and an increase in services that use less energy, 4) growth in per capita GDP, and 5) rising population. Over the period 1963-2008, annual U.S. carbon dioxide emissions slightly more than doubled, because growth in emissions potential attributable to increases in population and GDP per person outweighed reductions contributed by lowered energy and carbon intensity and changes in economic structure (Figure 27.2). Each series in the figure illustrates the quantity of cumulative emissions since 1963 that would have been generated by the effect of the associated driver. By 2008, fossil fuel burning had increased CO2 emissions by 2.7 billion tons over 1963 levels. However, by itself the observed decline in energy would have reduced emissions by 1.8 billion tons, while the observed increase in per capita GDP would have increased emissions by more than 5 billion tons. Figure 27.2: This graph depicts the changes in carbon dioxide (CO2) emissions over time as a function of five driving forces: 1) the amount of CO2 produced per unit of energy (CO2 intensity); 2) the amount of energy used per unit of gross domestic product (energy intensity); 3) structural changes in the economy; 4) per capita income; and 5) population. Although CO2 intensity and especially energy intensity have decreased significantly and the structure of the U.S. economy has changed, total CO2 emissions have continued to rise as a result of the growth in both population and per capita income. (Baldwin and Sue Wing, 201337). After decades of increases, CO2 emissions from energy use (which account for 97% of total U.S. emissions) declined by around 9% between 2008 and 2012, largely due to a shift from coal to less CO2-intensive natural gas for electricity production.38 Trends in driving forces shown in Figure 27.2 are expected to continue in the future, though their relative contributions are subject to significant uncertainty. The reference case projection by the U.S. Energy Information Administration (EIA) shows their net effect being a slower rate of CO2 emissions growth than in the past, with roughly constant energy sector emissions to 2040.39 It must be recognized, however, that emissions from energy use rise and fall from year to year, as the aforementioned driving forces vary. reduction of emissions of non-CO2 greenhouse gases and black carbon; for example, by lowering methane emissions from energy and waste, transitioning to climate-friendly alternatives to hydrofluorocarbons (HFCs), cutting methane and nitrous oxide emissions from agriculture, and improving combustion efficiency and means of particulate capture. Programs underway that reduce carbon dioxide emissions include the promotion of solar, nuclear, and wind power and efficient vehicles. The Federal Government has implemented a number of measures that promote energy efficiency, clean technologies, and alternative fuels.46,47,48,49,50 A sample of these actions is provided in Table 27.1 and they include greenhouse gas regulations, other rules and regulations with climate co-benefits, various standards and subsidies, research and development, and federal procurement practices. The U.S. Environmental Protection Agency (EPA) has a 40-year history of regulating the concentration and deposition of criteria pollutants (six common air pollutants that affect human health). A 2012 Supreme Court decision upheld the EPA’s finding that greenhouse gases “endanger public health and welfare.”51 This ruling added the regulation of greenhouse gas emissions to the Agency’s authority under the Clean Air Act. Actions taken and proposed under the new authority have focused on road transport and electric power generation. 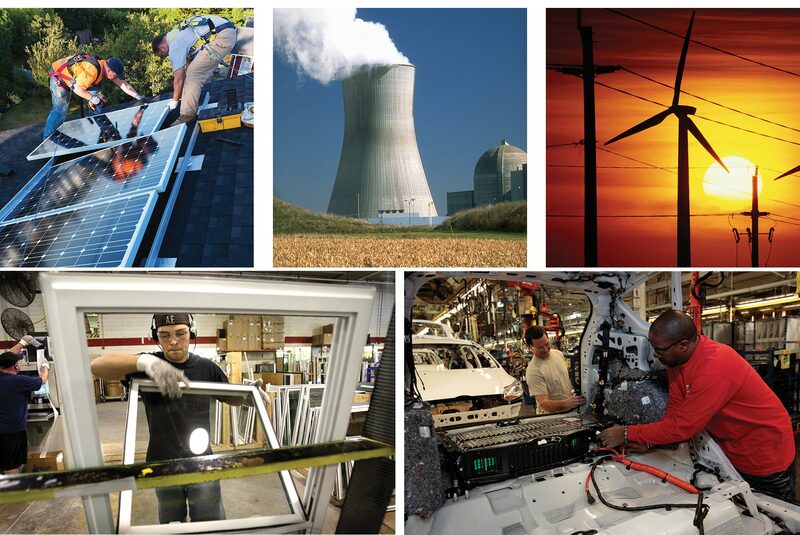 The U.S. Department of Energy (DOE) provides most of the funding for a broad range of programs for energy research, development, and demonstration. DOE also has the authority to regulate the efficiency of appliances and building codes for manufactured housing. In addition, most of the other federal agencies – including the Departments of Defense, Housing and Urban Development, Transportation, and Agriculture – have programs related to greenhouse gas mitigation. The Administration’s Climate Action Plan52 supplements these activities with a broad range of mitigation, adaptation, and preparedness measures. The mitigation elements of the plan are in part a response to the commitment made during the 2010 Cancun Conference of the Parties of the United Nations Framework Convention on Climate Change to reduce U.S. emissions of greenhouse gases by 17% below 2005 levels by 2020. Actions proposed in the Plan include: 1) limiting carbon emissions from both new and existing power plants, 2) continuing to increase the stringency of fuel economy standards for automobiles and trucks, 3) continuing to improve energy efficiency in the buildings sector, 4) reducing the emissions of non-CO2 greenhouse gases through a variety of measures, 5) increasing federal investments in cleaner, more efficient energy sources for both power and transportation, and 6) identifying new approaches to protect and restore our forests and other critical landscapes, in the presence of a changing climate. Jurisdiction for greenhouse gases and energy policies is shared between the federal government and the states.53 For example, states regulate the distribution of electricity and natural gas to consumers, while the Federal Energy Regulatory Commission regulates wholesale sales and transportation of natural gas and electricity. In addition, many states have adopted climate initiatives as well as energy policies that reduce greenhouse gas emissions. For a survey of many of these state activities, see Table 27.2. Many cities are taking similar actions. The most ambitious state activity is California’s Global Warming Solutions Act (AB 32), a law that sets a state goal to reduce greenhouse gas emissions to 1990 levels by 2020. The state program caps emissions and uses a market-based system of trading in emissions credits (cap and trade), as well as a number of regulatory actions. The most well-known, multi-state effort has been the Regional Greenhouse Gas Initiative (RGGI), formed by ten northeastern and Mid-Atlantic states (though New Jersey exited in 2011). RGGI is a cap and trade system applied to the power sector with revenue from allowance auctions directed to investments in efficiency and renewable energy. The Carbon Disclosure Project has the largest global collection of self-reported climate change and water-use information. The system enables companies to measure, disclose, manage, and share climate change and water-use information. Some 650 U.S. signatories include banks, pension funds, asset managers, insurance companies, and foundations. Many local governments are undertaking initiatives to reduce greenhouse gas emissions within and outside of their organizational boundaries.35,36 For example, over 1,055 municipalities from all 50 states have signed the U.S. Mayors Climate Protection Agreement,34 and many of these communities are actively implementing strategies to reduce their greenhouse gas footprint. Under the American College and University Presidents’ Climate Commitment (ACUPCC), 679 institutions have pledged to develop plans to achieve net-neutral climate emissions through a combination of on-campus changes and purchases of emissions reductions elsewhere. Voluntary compliance with efficiency standards developed by industry and professional associations, such as the building codes of the American Society of Heating, Refrigerating and Air-Conditioning Engineers (ASHRAE), is widespread. Federal voluntary programs include Energy STAR, a labeling program that identifies energy efficient products for use in residential homes and commercial buildings and plants, and programs and partnerships devoted to reducing methane emissions from fossil fuel production and landfill sources and high GWP emissions from industrial activities and agricultural conservation programs. There is significant interest in quantifying the air pollution and human health co-benefits of greenhouse gas mitigation, particularly from the public health community,60,63 as the human health benefits can be immediate and local, in contrast to the long-term and widespread effects of climate change.64 Many studies have found that monetized health and pollution control benefits can be of similar magnitude to abatement costs (for example, Nemet et al. 2010; Burtraw et al. 200364,65). Methane reductions have also been shown to generate health benefits from reduced ozone.66 Similarly, in developing nations, reducing black carbon from household cook stoves substantially reduces air pollution-related illness and death.67,68,69 Ancillary health benefits in developing countries typically exceed those in developed countries for a variety of reasons.64 But only in very few cases are these ancillary benefits considered in analyses of climate mitigation policies. To meet the emissions reduction in the lower (B1) scenario used in this assessment (Ch. 2: Our Changing Climate) under reasonable assumptions about managing costs, annual global CO2 emissions would need to peak at around 44 billion tons within the next 25 years or so and decline steadily for the rest of the century. At the current rate of emissions growth, the world is on a path to exceed the 44 billion ton level within a decade (see “Emissions Scenarios and RCPs”). Thus achievement of a global emissions path consistent with the B1 scenario will require strenuous action by all major emitters. Policies already enacted and other factors lowered U.S. emissions in recent years. The Annual Energy Outlook prepared by the EIA, which previously forecasted sustained growth in emissions, projected in 2013 that energy-related U.S. CO2 emissions would remain roughly constant for the next 25 years.39 Moreover, through the President’s Climate Action Plan, the Administration has committed to additional measures not yet reflected in the EIA’s projections, with the goal of reducing emissions about 17% below 2005 levels by 2020. Still, additional and stronger U.S. action, as well as strong action by other major emitters, will be needed to meet the long-term global emission reductions reflected in the B1 scenario. Achieving the B1 emissions path would require substantial decarbonization of the global economy by the end of this century, implying a fundamental transformation of the global energy system. Details of the energy mix along the way differ among analyses, but the implied involvement by the U.S. can be seen in studies carried out under the U.S. Climate Change Science Program20 and the Energy Modeling Forum.70,71,72,73 In these studies, direct burning of coal without carbon capture is essentially excluded from the power system, and the same holds for natural gas toward the end of the century – to be replaced by some combination of coal or gas with carbon capture and storage, nuclear generation, and renewables. Biofuels and electricity are projected to substitute for oil in the transport sector. A substantial component of the task is accomplished with demand reduction, through efficiency improvement, conservation, and shifting to an economy less dependent on energy services. The challenge is great enough even starting today, but delay by any of the major emitters makes meeting any such target even more difficult and may rule out some of the more ambitious goals.20,70 A study of the climate change threat and potential responses by the U.S. National Academies therefore concludes that there is “an urgent need for U.S. action to reduce greenhouse emissions.”75 The National Research Council (NRC) goes on to suggest alternative national-level strategies that might be followed, including an economy-wide system of prices on greenhouse gas emissions and a portfolio of possible regulatory measures and subsidies. Deciding these matters will be a continuing task, and U.S. Administrations and Congress face a long series of choices about whether to take additional mitigation actions and how best to do it. Two supporting activities will help guide this process: opening future technological options and development of ever-more-useful assessments of the cost effectiveness and benefits of policy choices. Because they are in various stages of market maturity, the costs and effectiveness of many of these technologies remain uncertain: continuing study of their performance is important to understanding their role in future mitigation decisions.78,79 In addition, evaluation of broad policies and particular mitigation measures requires frameworks that combine information from a range of disciplines. Study of mitigation in the near future can be done with energy-economic models that do not assume large changes in the mix of technologies or changes in the structure of the economy. Analysis over the time spans relevant to stabilization of greenhouse gas concentrations, however, requires Integrated Assessment Models, which consider all emissions drivers and policy measures that affect them, and that take account of how they are related to the larger economy and features of the climate system.20,70,80,81,82 This type of analysis is also useful for exploring the relations between mitigation and measures to adapt to a changing climate. There are various ways in which mitigation efforts and adaptation measures are interdependent (see Ch. 28: Adaptation). For example, the use of plant material as a substitute for petroleum-based transportation fuels or directly as a substitute for burning coal or gas for electricity generation has received substantial attention.83 But land used for mitigation purposes is potentially not available for food production, even as the global demand for agricultural products continues to rise.84,85,86 Conversely, land required for adaptation strategies, like setting aside wildlife corridors or expanding the extent of conservation areas, is potentially not available for mitigation involving the use of plant material, or active management practices to enhance carbon storage in vegetation or soils. These possible interactions are poorly understood but potentially important, especially as climate change itself affects vegetation and ecosystem productivity and carbon storage. Increasing agricultural productivity to adapt to climate change can also serve to mitigate climate change. Continued development of these analytical capabilities can help support decisions about national mitigation and the U.S. position in international negotiations. In addition, as shown above, mitigation is being undertaken by individuals and firms as well as by city, state, and regional governments. The capacity for mitigation from individual and household behavioral changes, such as increasing energy end-use efficiency with available technology, is known to be large.87 Although there is capacity, there is not always broad acceptance of those behavioral changes, nor is there sufficient understanding of how to design programs to encourage such changes.88 Behavioral and institutional research on how such choices are made and the results evaluated would be extremely beneficial. For many of these efforts, understanding of cost and effectiveness is limited, as is understanding of aspects of public support and institutional performance; so additional support for studies of these activities is needed to ensure that resources are efficiently employed. Engineering and scientific research is needed on the development of cost-effective energy use technologies (devices, systems, and control strategies) and energy supply technologies that produce little or no CO2 or other greenhouse gases. Better understanding of the relationship between emissions and atmospheric greenhouse gas concentrations is needed to more accurately predict how the atmosphere and climate system will respond to mitigation measures. processes controlling the land sink of carbon in the U.S. require additional research, including better monitoring and analysis of economic decision-making about the fate of land and how it is managed, as well as the inherent ecological processes and how they respond to the climate system. Uncertainties in model-based projections of greenhouse gas emissions and of the effectiveness and costs of policy measures need to be better quantified. Exploration is needed of the effects of different model structures, assumptions about model parameter values, and uncertainties in input data. Social and behavioral science research is needed to inform the design of mitigation measures for maximum participation and to prepare a consistent framework for assessing cost effectiveness and benefits of both voluntary mitigation efforts and regulatory and subsidy programs. -- For light-duty vehicles, rules establishing standards for 2012-2016 model years and 2017-2025 model years. -- For heavy- and medium-duty trucks, a rule establishing standards for 2014-2018 model years. -- A proposed rule setting limits on CO2 emissions from future power plants. -- A rule setting greenhouse gas emissions thresholds to define when permits under the New Source Review Prevention of Significant Deterioration and Title V Operating Permit programs are required for new and modified industrial facilities. -- A program requiring annual reporting of greenhouse gas data from large emission sources and suppliers of products that emit greenhouse gases when released or combusted. -- A rule revising New Source Performance Standards and National Emission Standards for Hazardous Air Pollutants for certain components of the oil and natural gas industry. -- Particle control regulations affecting mobile sources (especially diesel engines) that reduce black carbon by controlling direct particle emissions. -- The requirement to blend increasing volumes of renewable fuels. -- Identification and evaluation of information relevant to a baseline assessment of carbon stocks. -- Reporting of net carbon stock changes on forestland. -- Energy efficiency standards and test procedures for residential, commercial, industrial, lighting, and plumbing products. -- Model residential and commercial building energy codes, and technical assistance to state and local governments, and non-governmental organizations. -- Weatherization assistance for low-income households, tax incentives for commercial and residential buildings and efficient appliances, and support for state and local efficiency programs. -- Loan guarantees for innovative energy or advanced technology vehicle production and manufacturing; investment and production tax credits for renewable energy. -- Programs on clean fuels, energy end-use and infrastructure, CO2 capture and storage, and agricultural practices. -- Executive orders and federal statutes requiring federal agencies to reduce building energy and resource consumption intensity and to procure alternative fuel vehicles. -- Agency-initiated programs in most departments oriented to lowering energy use and greenhouse gas emissions. Table 27.1: A number of existing federal laws and regulations target ways to reduce future climate change by decreasing greenhouse gas emissions emitted by human activities.